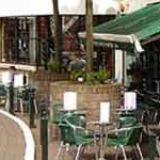 For superb meals in a relaxed and sociable environment try visiting the wonderful Green Room cafe bar. Whether you’re looking for a pre-theatre dinner or just a light lunch with friends, it is an ideal destination for all occasions. 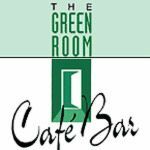 Do you work at Green Room Cafe Bar? What did you think of Green Room Cafe Bar? I love coming here for lunch, its so delicious and beats anywhere else hands down when it comes to sanwiches! |Its very relaxing here. Food is very well presented and the staff extremely pleasant.Always eat here before a show. I used to love eating here but have to say in recent months the standard of food is now not so good. The menu is tired and I have to say overpriced. Although it can be quiet in the day The Green Room comes alive in the evening when it refreshes theatre-goers. The Green Room is opposite the Hippodrome and the Birmingham Royal Ballet and so it caters very much for the theatre-loving crowd. It has a raised stone patio outside with green chairs and metal tables. Inside the overall feel is open, light and airy and there’s quite a continental feel to the place with its neutral lime green, creams and metals and it’s equal emphasis on food, hot drinks and alcohol. It has lime green walls and exposed tubing running along the tall black ceiling and there are lots of wooden tables and chairs for sitting and eating at too and it’s ideal for a coffee in the daytime. 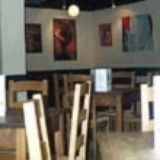 Modern art prints adorn the walls and there are low sofas around low tables and lots more seating at the back. Most of the people in here are either on their way to, or back from, the theatre or ballet across the road so it’s generally a mature, cultured, middle-England type crowd. 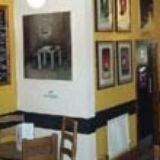 Over the years a few celebrities have dined here and left their mark on a celebratory signature wall which is dominated by a picture of Rolf Harris by Rolf Harris. On tap you’ve got a choice of Peetermans for £3.05 a pint, Stella which you can get a jug of for £6.50, Beck’s and Franziskaner. In bottles there’s Corona, Staropramen, Beck’s, Peroni, Leffe and Thatcher’s. There are half a dozen each of red and white wines, costing about £12 to £15 and the house French Merlot is fairly light-bodied and decent enough at £4.55 for a large glass. The menu comprises crusty bread sandwiches for around £5 to £7, bagels, baguettes, steaks, salads and main courses, such as tuna in peppercorns with new potatoes for £11.50 or lamb shank with chive mash and red wine jus for £12.50. A light and airy continental style bar which caters for an upmarket crowd.